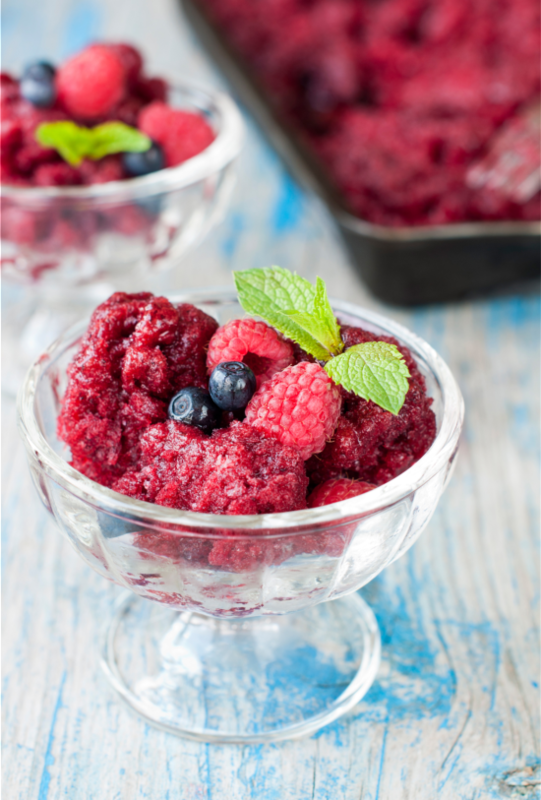 Easy Mixed Berry Sorbet Recipe bursting with berry flavor & chock-full of antioxidants this low calorie, refined sugar free dessert won’t blow your diet. 1-8 oz. Bag Frozen Mixed Berries or 8 oz. Fresh Mixed Berries or just one kind of berry: Raspberries, Blueberries, Strawberries, Blackberries, etc. DIRECTIONS—thaw frozen berries, slightly. Add to blender along with fruit juices. Blend until smooth. Optional—add a few drops of 100% Stevia. To remove seeds, run mixture through fine mesh strainer or sieve, into an 8 x 8 baking pan. Freeze about 1 hour, or until firm. Using tines of large fork, scrap frozen sorbet from pan. If sorbet freezes too hard, let stand at room temperature, until soft enough to work with. Garnish with sprig of mint and fresh berries. NOTE – you can also make this by running frozen fruit only through a Yonanas machine. Omit the fruit juices and sweetener. To sweeten, run an over ripe banana, sliced, and frozen through the Yonanas Machine along with the frozen berries. 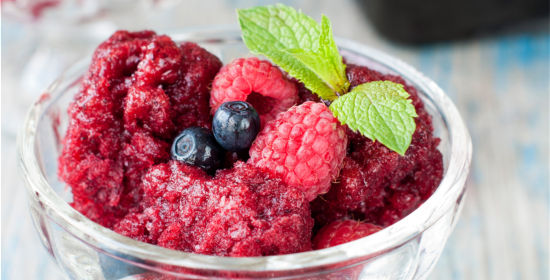 Metatags: Easy Mixed Berry Sorbet Recipe bursting with berry flavor & chock-full of antioxidants this low calorie, refined sugar free dessert won’t blow your diet.